I’ve always wanted to try something wrapped in banana leaves. When I saw this recipe on Simply Recipes, I decided it was time. Now, her recipe calls for the traditional orange and lime juices to be used as the base for the marinade. When I went looking for the ingredients, I thought that I had a can of orange juice concentrate in the freezer.. but alas, it was not so. And, wonder of wonders, I had half a bag of cranberries in the freezer door! Problem solved. In a blender the night before you wish to cook, combine cranberries, lemon, salt and achiote paste. Add enough water or stock to make the marinade easily pourable. Cut the pork into 1″ – 2″ cubes, leaving the fat for braising. 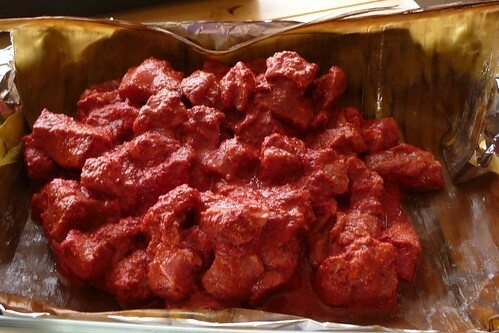 Place into a non-reactive container (glass, metal or ziptop baggie) then pour the marinade over the pork. Mix well and chill for 8 to 24 hours. Preheat the oven to 325F. Line a 9″x12″ casserole dish with foil. If using banana leaves, layer one or two leaf sections across the bottom. Pour in the pork mixture along with the marinade. Layer more leaf sections over the pork (about 2 – 3 layers) or use foil and close tightly. Bake for 3 hours or more. Check the meat at 3 hours to see if the pork shreds easily – it should be just about falling apart. 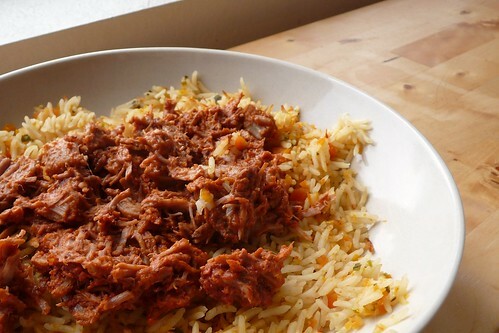 Remove the meat and sauce to a bowl and shred with two forks. 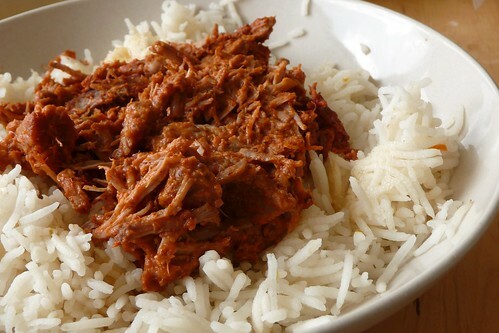 Serve over Mexican Rice or use as meat for tacos or sandwiches. This entry was posted in dairy-free, gluten-free, mexican, pork, recipes, sauce, untranslated. Bookmark the permalink.